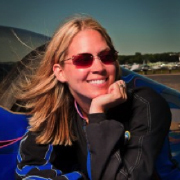 Award-winning aerobatic pilot, free fly skydiver and champion rock climber, Melissa Pemberton brings a high-energy, action-packed display of Unlimited Aerobatics with her Edge 540 Aircraft to audiences world wide. Her dazzling performances have been thrilling audiences all over the globe with gyroscopic maneuvers, tumbles, rolls and every- thing in between. Her thrilling and entertaining display both amazes and inspires audiences. However a stunt plane is not all that she flies. Melissa is also an avid skydiver. She is among the best in the world at free flying. She enjoys flying her wingsuit and has over 300 base jumps. Melissa strives to be a positive role model and inspiration to young people and women across the world, showing them by example that no dream is too big and nothing is impossible!